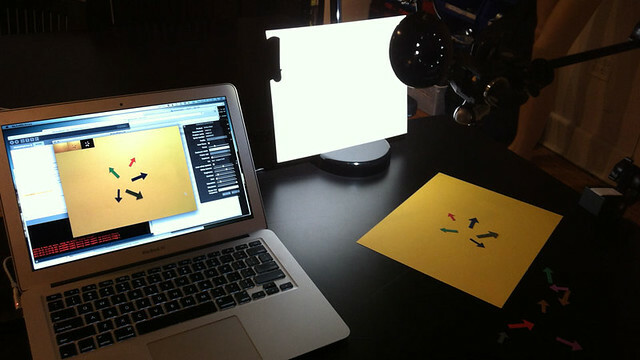 Me and My Arrow is an interactive animation experiment that uses Principal Component Analysis to determine the orientation of paper arrows and animates them automatically in realtime. It was created for Greg Borenstein’s Makematics class at ITP. The music track is Harry Nilsson’s Me and My Arrow. Built in Processing, the sketch first saves a snapshot of the blank paper on key press. Once the paper arrows are in place, a subsequent key press then alters the image using OpenCV to create a black and white matte. Blob detection is run on the matte to locate individual arrows, which are extracted from the main image and sent through a Java-based PCA library to determine their orientation. Based on this information, the arrows are masked out of the image using the same black and white matte and animated over the original blank scene.